Odds are, any thought you’ve given to the drought is pretty cursory. Sure, you’ve heard that we’re short on water, and maybe you’re even starting to turn off the tap more quickly than usual. But if you live in a relatively large city where water managers have planned ahead, your worry is simply theoretical at this point. 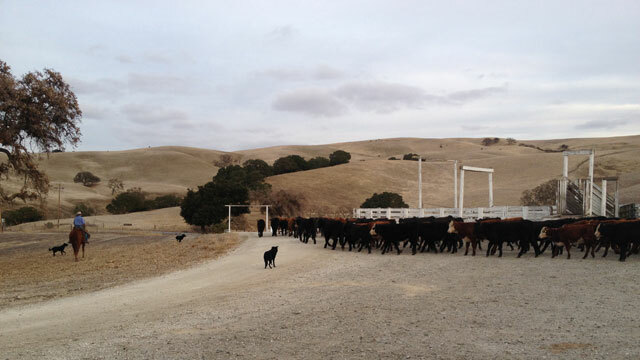 Morris owns Morris Grassfed in San Juan Bautista, which is about 15 minutes south of Gilroy on California’s Central Coast. He says the long stretch of dry months forced him to cut his herd -- it’s now half its usual size. 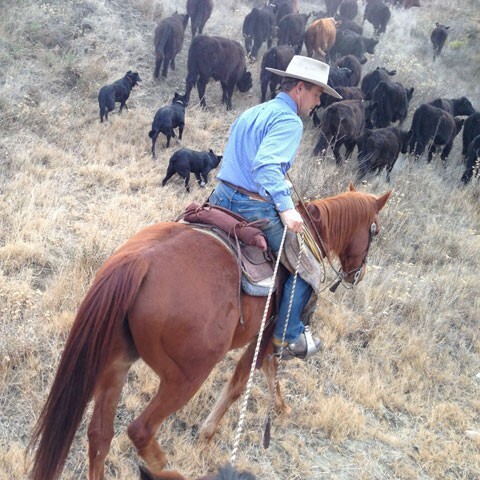 Other ranchers across the state have been cutting their herds, too. “Heart palpitations at 3 in the morning are kind of a fairly common experience for ranchers in this situation,” he said. Morris said he’s had to sell off calves early and say no to managing cattle for a bigger company, so that he could be sure his own cows get enough to drink. Ranchers are among the first to feel a drought. That’s because they rely on creeks and streams to provide drinking water and on rain to nourish the vegetation. Morris’ counterparts in the farming world are also feeling it. Almond grower Shawn Coburn operates 3,500 acres in three counties: Fresno, Merced and Madera. And in a typical year he grows almonds, wine grapes, tomatoes, alfalfa and a few other crops. This year, though, the lineup might be a bit different. “We’re probably not going to grow any row crops whatsoever this year and just try to keep trees and vines alive,” Coburn said. That means no cantaloupes, no tomatoes, and -- for his almond trees and vineyards -- there are some difficult decisions coming up. “Of course growers in the Central Valley in particular, right around now is usually when they’re making their planting decisions,” said Jeanine Jones, deputy drought manager for the state Department of Water Resources. She says farmers are weighing decisions such as how much water to use to maintain permanent plantings, like trees and vines, or the need to fallow land that would normally hold row crops. For farmers around the state, the price of water is skyrocketing. One Central Valley Water District recently put some stored water up for bid. What used to cost around $400 per acre-foot is now selling for upward of $1,000 per acre-foot. Coburn says having plenty of cash isn’t enough to solve the problem. Jones and the State Water Project -- which stores and delivers water in a system of reservoirs and aqueducts -- say that this year farmers who get state water will get no water at all. That compares to the more typical 65 to 70 percent in a more normal rainfall year. Growers who get water from a federally run system that serves the Central Valley are expecting bad news, too. The formal announcement of how much they’ll get is likely to be made in late February. One of Coburn’s colleagues said today’s drought might be the worst he can remember. Grant Craven grows almonds, walnuts and fruits in Stanislaus and Fresno counties. He remembers droughts in 1976, the early 1990s and more recently 2009. Coburn said today’s water shortage is a game changer: He might soon be forced to cut jobs for some of his workers, many of whom live paycheck to paycheck. Politicians and state leaders are scrambling to help farmers and ranchers cope -- introducing various plans to conserve or free up water, or to manage it differently. The growers who can pump groundwater will do that. Those who can’t are left with very few options. Whatever happens, leaving land fallow will mean fewer cantaloupes, tomatoes, almonds and crops of all kinds on the market. And before too long, that’s likely to lead to higher prices at the grocery store.